The following were convicted at Sheffield, Barnsley, Doncaster and Chesterfield magistrates’ courts between February 14 and 20. Max Everett: aged 25, of Arbourthorne Road, Heeley, drug driving, driving without a licence, driving without insurance, £220 fine, £115 costs, disqualified from holding a driving licence for 12 months. Samantha Gerrard: aged 28, of Sheppherd Drive, Maltby, Rotherham, theft, failed to provide a non-intimate sample, committed a further offence while subject to a conditional discharge, community order, drug rehabilitation requirement, £170 costs. Ahmed Mohamood Jama: aged 37, of Greenland Drive, Darnall, drunk and disorderly, £100 fine. Alan Jones: aged 46, of no fixed address, theft, failed to provide a non-intimate sample, eight weeks in prison, £115 costs. John Pinnock: aged 35, of Prince of Wales Hotel, Princes Street, Masbrough, Rotherham, theft, failed to surrender to custody, 80 costs. Stephen Alan Nichols: aged 28, of no fixed address, breach of non-molestation order, community order, rehabilitation activity requirement, unpaid work requirement, £170 costs. Gareth Troop: aged 21, of Goldsmith Drive, Herringthorpe, Rotherham, theft, £50 fine. Connor Matthew Broadly: aged 22, of Deerlands Avenue, Parson Cross, using abusive language or behaviour to cause alarm and distress, £250 fine, £115 costs, football banning order imposed. Martin Lewis Broadly: aged 30, of Nethershire Lane, Shiregreen, using abusive language or behaviour to cause alarm and distress, £250 fine, £115 costs, football banning order imposed. Philip Antony Preece: aged 44, of Bard Street, Park Hill, breach of restraining order, committed a further offence while subject to a suspended sentence, community order, unpaid work requirement, £170 costs, restraining order varied. Scott Andrew Roberts: aged 32, of Ravenscroft Road, Richmond, using abusive language or behaviour to cause alarm and distress, committed a further offence while subject to a conditional discharge, £150 fine, £115 costs. Mircea-Florin Claie: aged 33, of Gladstone Road, Hexthorpe, Doncaster, failed to give information about the driver of a vehicle to the police, £660 fine, £145 costs. Melu Muntean: aged 32, of Cow House Lane, Armthorpe, Doncaster, failed to give information about the driver of a vehicle to the police, £660 fine, £145 costs, disqualified from holding a driving licence for 12 months. Jack Robinson: aged 22, of Montagu Road, Sprotbrough, Doncaster, failed to give information about the driver of a vehicle to the police, £600 fine, £145 costs, six points on driving licence. Mihai-Lucian Ivan: aged 32, of St Vincent Road, Town Centre, Doncaster, failed to give information about the driver of a vehicle to the police, £660 fine, £151 costs, disqualified from holding a driving licence for six months. Ben Dale Gavin Quinn: aged 37, of Urban Road, Hexthorpe, failed to comply with the supervision requirements following a period in prison, supervision default order made, curfew requirement with electronic monitoring, £75 costs. Mehmet Kucukbalaban: aged 77, of Wickett Hern Road, Armthorpe, sexually touched a woman over the age of 16 when she did not consent, six months in prison suspended for two years, rehabilitation activity requirement, £500 compensation, must register with the police for seven years under the Sexual Offences Act 2003. Sarah Birchall: aged 35, of Coterel Crescent, Cantley, drink driving, community order, curfew requirement with electronic monitoring, £170 costs, disqualified from holding a driving licence for 28 months. Danny Carrick: aged 30, of Littlemoor Lane, Balby, produced a class B drug, community order, rehabilitation activity requirement, £250 fine, £170 costs, order for the destruction of the drug. Lewis James Roy Ezard-Walters: aged 18, of Ripon Avenue, Wheatley Hills, driving without insurance, criminal damage, conditionally discharged for nine months, £120 fine, £75 compensation, £85 costs, eight points on driving licence. Christopher John Hesketh: aged 36, of Wellcroft Close, Wheatley Hills, failed to stop at the scene of an accident, drink driving, driving without insurance, community order, unpaid work requirement, £300 compensation, £85 costs, disqualified from holding a driving licence for 16 months. Adam James Brown: aged 26, of Blackwood Avenue, Balby, possession of a class B drug, £120 fine, £115 costs, order for the destruction of the drug. Adam Brown: aged 22, of Church View, Wadworth, drug driving, £120 fine, £115 costs, disqualified from holding a driving licence for 12 months. Mark John Chapman: aged 35, of Danum Court, Denaby Main, drink driving, £300 fine, £115 costs, disqualified from holding a driving licence for 22 months. Richard Corrie Fisher: aged 28, of Buttermere Crescent, Lakeside, drink driving, community order, unpaid work requirement, £170 costs, disqualified from holding a driving licence for two years. Johnie Gravil: aged 47, of Lichfield Road, Wheatley, theft, community order, rehabilitation activity requirement, unpaid work requirement, £300 compensation. Lukas Horvath: aged 23, of Apley Road, Hyde Park, taking a vehicle without consent, driving without insurance, driving without a licence, £250 fine, £115 costs, six points on driving licence. 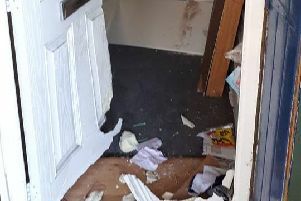 Ryan Varley: aged 29, of no fixed address, used violence to gain entry in to premises knowing somebody inside the building opposed entry, criminal damage, committed a further offence while subject to a suspended sentence, 22 weeks in prison, restraining order imposed, £100 compensation. Jacqueline Stocks: aged 61, of Lockwood Road, Goldthorpe, drink driving, £120 fine, £115 costs, disqualified from holding a driving licence for 18 months. Shaun Anton Wragsdale: aged 37, of Derby Road, theft, community order. Keiron Anthony Walker: aged 28, of Heath Court, assault, community order, £100 compensation, £85 costs.